Do You Know this Signal? Sold But Not Opened? When researching a franchise, either as buyer, prospective franchisee, or credit analyst, one item of a franchisor's FDD is worth serious attention: how many locations have been sold but are not opened? The opposite of churning franchisees, is SNO'ing them: selling them a location or territory, which never opens, and then scooping the franchisee fee. The SNO data is found in Item 20 in the FDD, a document hardly every reviewed by any of the public, analysts or prospective franchisees. Yet, it provides valuable information to those willing to look. With all this public information, why does pre-sale churning continue? Here are three examples of the type of SNO information that is revealed in the FDD. 1. From the 2010 MRI International FDD. You can see that the system has contracted from 903 to 828 in 3 years. Something to ask about. Table 5 has a helpful column for the number of SNO's. 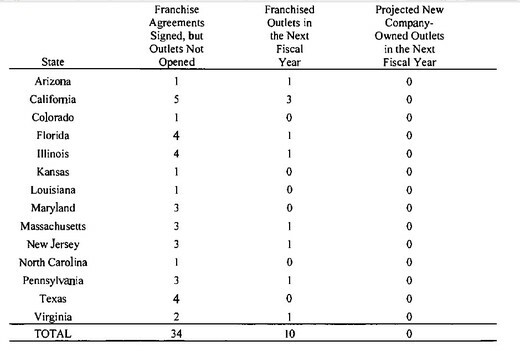 We go to the bottom of table 5 and find out that there are zeros SNOS, but 30 projected new outlets. 2. Auntie Anne's Pretzel's Item 20 from the 2010 FDD. 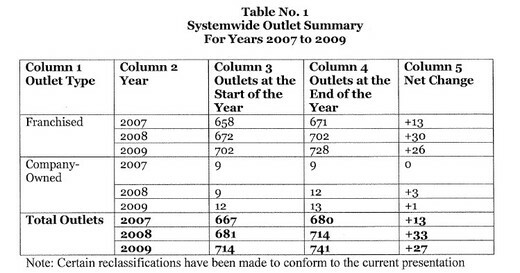 We can see that there was growth in the system from 2007 to 2009, from 667 to 741. Next, we are given some SNO data. The trend of SNO's from 2007 to 2009 appears to be getting better, with more stores opening than being sold. Finally, let's look at Aunite Anne's Table 5. Ok, we have 12 SNO's and another 27 projected opens. Nothing too alarming here, but again worth a couple of follow up questions. 3. Kiddie Academy's Item 20 from their 2011 FDD. The data is not presented as cleanly as the Auntie Anne's or MRI Item 20 data, which may not be the franchisor's fault. But, there is a very important detail, filed in an later amendment, which we will get to shortly. Here is Table 1 from Kiddie Academy. Alright, this is not entirely clear. But, it appears there has been decent growth from 2007 to 2010, from 77 units to 106. But, when we read the amendment, a number of startling details emerge to counter-act this rosy picture of growth. This states that approximately 21% of the system was allowed to leave! Voluntary termination, but the franchise territory did not remain part of the system! Well, that certainly must be a very interesting story - and a prospect would want to track down all the details behind this "voluntary termination". You would certainly want to meet the franchisee who had this much bargaining power on termination - he took his territories with him. Sort of like losing the war but imposing sanctions on the victor! Extremely agile bargaining on behalf of the franchisee. Not so much by the franchisor. Let's look at the SNO data. In Conclusion - Remember Charlie Brown, Lucy, and the Football. The cartoon below should be a reminder to all prospective franchisees not to rely on the legal skills of a beagle. Read and understand the item 20 data instead. If you don't want to read it, and your current business lawyer doesn't want to get paid to read it for you, then consider hiring an attorney who specializes in this area.